X-Large - $53.99 Only 4 left! We’re sensing a theme, here. 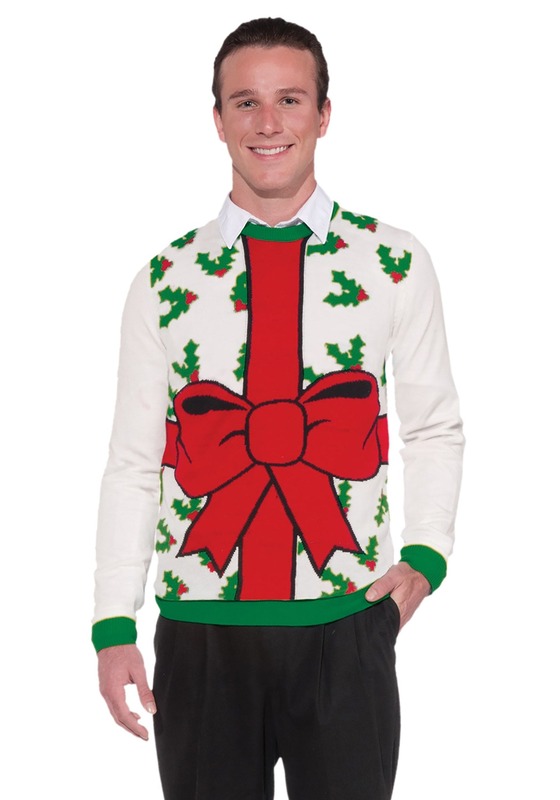 For Halloween you dressed yourself as a big wrapped box and wrote a tag that said, “God’s Gift to Women,” and now this All Wrapped Up Ugly Christmas Sweater. Well, if the system isn’t broke, why fix it, right? This is one sweater you can also wear home to a family gathering, since your mom already thinks you’re the greatest gift the world has ever seen. Later, when you debut this pullover knit at your pal’s sweater party, you may genuinely intend to hook yourself a holiday sweetie this yule. We must admit that this sweater--with its big red bow and sprigs of holly--has an almost annoyingly effective charm. And, while you probably won't have to get down underneath the Christmas tree, we can’t guarantee it--that’s the price you pay for turning yourself into a highly anticipated cultural symbol. But who knows, it could all pay off as you get “unwrapped” later on. Wink, wink.